5th Avenue is a clothing/lifestyle shop with an eatery inside on Bessy Beach, next to Nassaa Uth Hub. 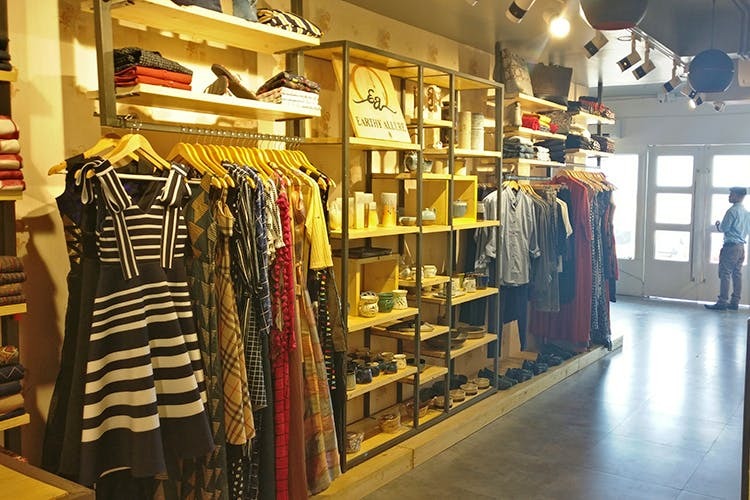 5th Avenue is a shop on Besant Nagar Beach named eponymously after the road it’s on, that focuses on lifestyle, clothing for men, women, and kids, and oddly food too. The concept behind the store is to collaborate with local brands and create a patchwork store where brands and designers can retail their products under one roof. The two storey building has an ice cream parlour, home décor space and a womenswear section on the ground floor. Summer dresses from local designers Shuki and Arodhi stock their womenswear shelves. On the home décor front, Pondicherry brand Earthly Allure, has a collection of ceramics made by hand that use organic dyes for colour. Everyone’s favourite, Happiness Factory has it’s curios on display too. On the food front, we were pleased to note that the ice cream parlour, Cream Chemistry piqued our interest too. Variety was the name of the game there, there are nitrogen ice creams, pan rolled ice creams, charcoal ice cream, taco ice creams, waffles and more. Our favourite of them all was the Matcha Green ice cream which is the minty Japanese Matcha tea mixed with Oreos and ice creams. Moving upstairs, we found the men's and kidswear section along with their café. We were told that the men's and kidswear sections are yet to find designers and brands to collaborate with and hence the clothes that are stocked there are pretty vanilla. We’ll keep you posted on when they come up with better stock. The café (which is currently closed) is run by UBCR a fairly small chain of coffee shops with an interesting lineup of preparations. Heard of a Melya? It’s a coffee with cocoa powder and honey! Or a have you tried a chocolate chicken cashew sandwich? No? Well, you can here. We’re looking forward to trying out those zany preparations when the café opens again in a week. All in all, there’s something here to appeal to almost everyone, do check it out the next time you’re at Bessy Beach.